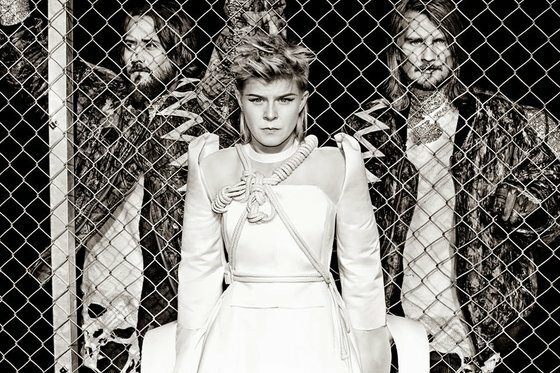 Röyksopp & Robyn have been touring Europe and the States with a series of gigs to promote their collaborative 'mini-album' Do It Again (for a review, head over here), and one of their appearances was on Jimmy Kimmel Live. Two live recordings from that show have since made their way to Youtube; these songs include the title track "Do It Again" and the fantastic opening number "Monument". Check out the performances below - mullets, platform shoes and Scandinavian synths galore! While the high-energetic dance anthem "Do It Again" gets the crowd going (obviously), the same can't be said about "Monument", which is a shame as in my opinion, it's the best track from the EP (along with "Do It Again"). The eight-minute rendition of the ethereal synthpop number just doesn't seem to translate well live. Well, I guess that's the case with most atmospheric compositions - they're not even meant to get the people jumping up and down in a state of uncontrollable euphoria. Still, it's a captivating clip so you should definitely watch it. Also, take a look at how ruthlessly the mic stand has its fifteen minutes of fame stolen by an overenthusiastic roadie at 3:06. Poor little thing.